Meal prep is big these days, and getting easier to do than ever. 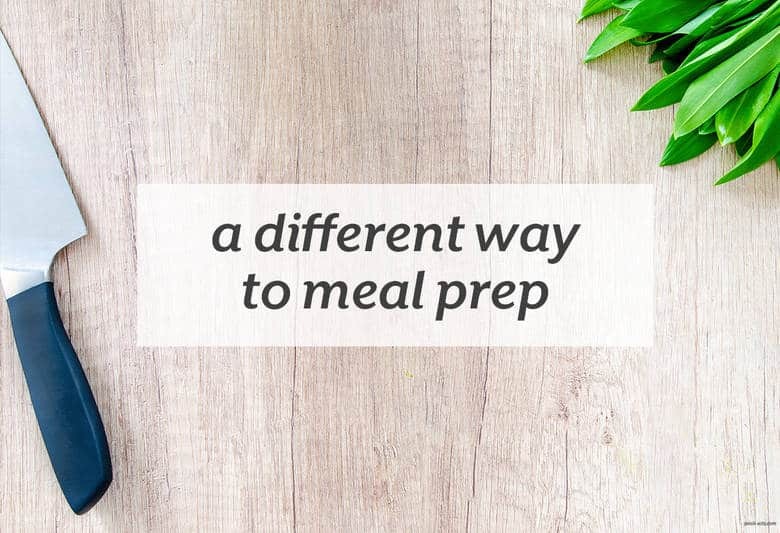 With the abundance of meal prep containers on Amazon to the huge popularity of the Instant Pot, more things are in your favor to make meal prep work. And it’s also still easy to not meal prep. Honestly, I think meal prep can also get a bad wrap. When most people really think about meal prep, they think about the endless meal prep containers filled with the brown rice, basic AF chicken breast, and steamed broccoli. Not super appealing, is it? And for some people, they prep in an assembly kind of way. They have more exciting meals than that, but the idea is similar: lunch this week is all chicken salad, dinner is all a protein style burger. Still kinda boring. But! There’s another way to approach meal prep. After all, meal prep is prepping your meals for the week, it’s open to lots of interpretation. I approach meal prep in a different way than what most people think of. If it vibes with you, try it out! I cook and prep for myself and my boyfriend, N. We eat at home 6 out of 7 nights a week most of the time. The seventh night could be leftovers from what we’ve made during the week, we go out or go over to a friend’s or family member’s house. We both work office jobs and leave pretty early (me to work in some quiet, him to get in a workout and commute). I pack both of us lunch and breakfast. I plan, prep and cook our meals as if we were serving around four (I’m never super exact) and I use the leftovers for our lunches. Depending on how busy it is, that could be for the next day, or the day after. I plan 5 different meals and try to make one of them slightly larger to cover a 6th day, or that 6th day becomes a leftover day. There are usually always a little bit of leftover sides from the meals. We also always have eggs in the house, 95% of the time we also have boxed greens so we can easily bulk up that 6th meal. We grocery shop on Sundays, then I’ll prep 75-80% of what we need to make that day as well. We make Sunday’s dinner together and that will become Monday’s lunch. Breakfast is the one meal that is the same for the entire week. Breakfast is a newer addition to my prep menu, and also making breakfast for N is an even newer development. He moved jobs recently, and the job he left had a stocked kitchen. The new one doesn’t and he was getting hungry way earlier for lunch and doesn’t have a lot of food options where he works, so now he gets a filling breakfast and lunch. Planning for me has been the key. I plan our meals the night before shopping, then before I start cooking, I make a list so I can see what needs to be done. If you sign up for my newsletter, you can get a free printable of that list in next week’s Wellness Wednesday newsletter. From there, I start batching my prep by roasting, cooking, and prepping as much as I can. I roast multiple sets of veggies at once, especially if they’re the same kind of vegetable and will take the same amount of time in the oven. I take full advantage of my Instant Pot and cook components of meals or the whole meal in it. While something’s in the oven, I’ll be cooking on the stove or prepping something else on the counter. I don’t 100% prep everything because I don’t need to. When I was working and studying for my NTP certification, I was prepping 99% so I would have more time to study after work and blog. Now that I don’t have that harder time restraint, I prep about most of what I need to and will probably do one thing the day we eat the meal, like sauté some greens or roast a vegetable. I prefer to prep all proteins and one pot/pan dishes on my prep day. I pack our meals the night before (usually right after we eat dinner) or day of because we only have a certain number of glass food storage containers and space to store them. I prefer these Pyrex rectangular dishes because they hold a good amount and they fit in our lunch boxes. I’ve moved away from using plastic containers because of all of the issues with chemicals and off-gassing when heated. I also have a blog post of some really specific shortcuts for meal prep for you to check out very soon. So, now that you know my approach, how can you apply that to you? Let’s break it down into smaller pieces. I would first look at what’s appealing to you and what you may want to try. Do you like that the meals are different? That you prep most of what you need on one day? That not everything has to be packed? Start where you are right now. Once you see the current situation, it’s easier to create lasting change with smaller steps, and it’s way less overwhelming. Do you meal prep in any way right now? Do you meal plan or shop for the whole week in one trip? What meals do you want to prep for? Do you have enough food storage containers to store everything? If the answers to a lot of those questions are no or not yet, consider starting those questions. Begin meal planning for the week. Choose the amount of dishes you’ll need based on your schedule and make your shopping list. Shop for the entire week/time you’ll need meals. If prepping for the entire week seems a bit much, start with a few days and work your way up. Buy a set of food storage containers that will fit your meals. If the amount of time prep takes kinda freaks you out, look at your schedule to see where you can carve out time. If you don’t see any, start logging your time. Once you get more aware of how you’re actually spending your time, you’ll be able to see where you can move some things around. If you’re already doing some kind of meal planning/prep, experiment with adding in things you may not be doing yet that interest you. That could be doing it more consistently, like each week rather than a few times a month or when the planets align. You could try making a larger amount of a meal so you’ll have some for the next day. Maybe consider getting a slow cooker or Instant Pot to help with your prep. Batch your roasting and cooking so you can get more done. Wherever you want to start, go for it and add in a few new experiments each week or month as you get more confident with meal prepping. The more you try it, the more you can make it your own and figure out what works best for you. Does this way of meal prepping sound more appealing to you? What about meal prep trips you up? What do you love/hate about meal prep? Let me know in the comments below!